When I was young, I used to love Kung-Fu Theater on Saturday afternoons. I loved the almost-constant theme of redemption in the lone hero, the larger than life adversary. I loved the settings and the fights. 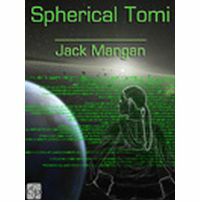 Jack Mangan's novella Spherical Tomi is kind of like that. In fact, it's exactly like that. Spherical Tomi is a kung-fu story set in space. And instead of hand to hand combat, the kung-fu is dished out in bytes and keystrokes. Our lone hero, Tomitsu, is responsible for the deaths of 105 people while she was part of a rebellion. The death-toll also included the love of her life, Nez. Distraught, Tomi sought a warrior's suicide, but the monks who'd taken her in refused to assist her until she'd atoned for her sins. So to gain this right, Tomi has herself jacked into a spare body called an itai and goes to work on a satellite cleaning the space debris from above the planet Cerberus, the home planet of president William Sterling, the man she feels is responsible for the death of Nez. By protecting this monster, Tomi feels she'll finally be able to atone for the deaths she caused. But when her former leader reappears just as President Sterling is returning home and demands Tomi's help in killing this man once and for all, everything Tomi had worked for so hard over her three years in this new body could be wiped out. Spherical Tomi is a very action-packed story, also very hard driving science fiction stuff here. It takes a while to acclimate yourself to the lingo, most of it a cross between sci-fi space talk and old-world Asian, but Mangan's created an interesting world in this story. I enjoyed spotting the kung-fu movie plot points and seeing how he'd adapted them for his space opera, especially the computer dual between Tomi and Sterling, which was just as exciting as any of those fast-paced battles I used to love watching on television. There are plenty of twists and secrets uncovered and everything is set up nicely for a sequel (which I assume is forthcoming since Mangan promises at the end that "all will soon be revealed"), even though if he never picks up this story again, it still ended in a good place and we can always fill in the blanks for ourselves. There was one chapter at the end I had a problem with, that took us out of the story during a critical moment. It would have worked better as an epilogue, I think, if it had to be included at all, which I'm not fully convinced it did. But that's a very small issue, only a couple of pages, really, and overall I enjoyed Spherical Tomi a lot more than I'd expected. I don't usually go for hard science fiction, but I found the themes and ideas in this story to be ones I could connect with and dig into. I liked it very much and would gladly recommend it to anyone else who likes the serious science fiction space stuff. Hell, I DON'T usually like that stuff, and I still liked Spherical Tomi. A definite 4 stars. This chapbook is available as an ebook at fictionwise or Amazon, or as a printed chapbook from the publisher.